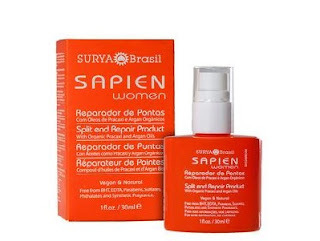 Surya Brasil SAPIEN Women Split End Repair. Great for any hair type, Split End Repair softens and repairs split ends without sticky residue or product build up. This all natural, organic and vegan styling super aid contains organic oils of Argan, Pracaxi, Madadamia, Buriti and Vitamin E as well as plant-based silicon derived from rapeseed (Brassica napus), a bright yellow flowering member of the mustard or cabbage family (Brassicaceae). It has a a fresh Coconut and Mango scent. Split ends are repaired, helped and hair looks like a million dollars. Use with other Surya Brasil hair products for best results. They are all natural, organic and vegan. I love how well this mends split ends. It's like magic.This product is applied to hair and worked through to ends. Style as usual. It also controls frizz. For me, that is a great double-duty product that helps make the most of my money. I hate my frizz. You will love this.